DR Action Video! Colt SCW (Sub-Compact Weapon) Personal Defense Weapon (PDW)-Type 5.56mm NATO AR SBR/Sub-Carbine Fired on Full-Auto at NDIA Range Day | DefenseReview.com (DR): An online tactical technology and military defense technology magazine with particular focus on the latest and greatest tactical firearms news (tactical gun news), tactical gear news and tactical shooting news. 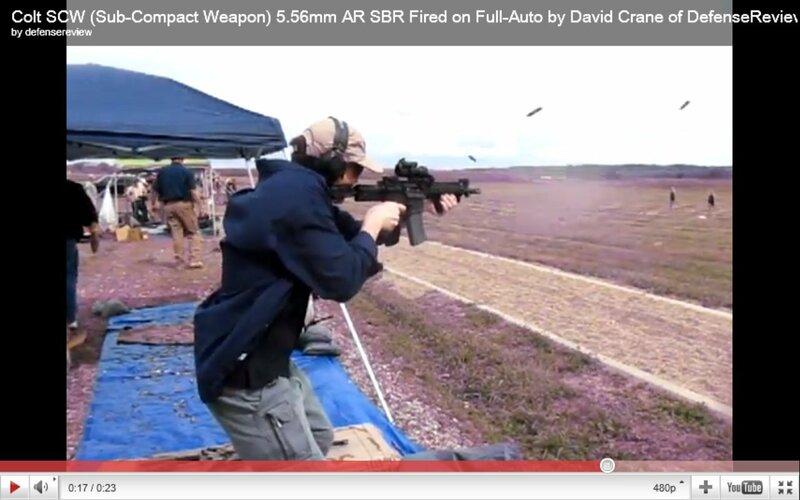 DefenseReview (DR) recently got the opportunity to test-fire the Colt SCW (Sub-Compact Weapon) (LE6945/SCW0921) select-fire 5.56x45mm NATO (5.56mm NATO)/.223 Rem. AR (AR-15) SBR (Short Barreled Rifle) again during the 2011 NDIA International Infantry & Joint Services Small Arms Systems Symposium, Exhibition & Firing Demonstration Range Day Shoot on May 26, 2011. We first reported on the weapon (Colt SCW) back in October 2008, after visiting the Colt Defense factory about a month previous to that and test-firing the weapon at Colt’s indoor range. We came away impressed with the weapon’s (Colt SCW) firing characteristics/qualities and operating system versatility, as it can be set up as either a direct-gas-impingement (DGI), gas piston/op-rod (operating rod), or DGI/piston/op-rod hybrid operating sytem. Colt’s proprietary gas piston/op-rod system is called the Colt Piston System (CPS), and their hybrid operating system is called the Colt Advanced Hybrid System (AHS). 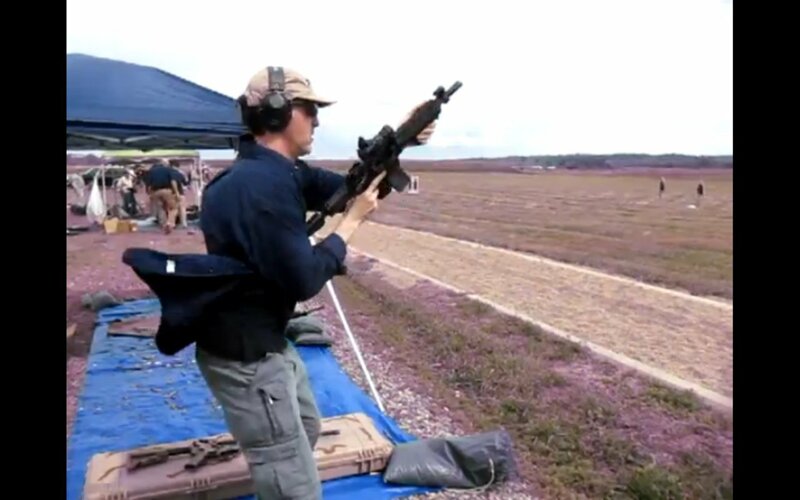 Like the weapon we initially ran in 2008 at the Colt Defense plant, the Colt SCW we test-fired on May 26, 2011 during the NDIA Infantry Small Arms Systems Symposium 2011 Range Day shoot operated via direct gas impingement. The Colt SCW shoots pretty smoothly in the DGI operating system configuration, and it’s proprietary folding/telescoping buttstock works pretty well. All things considered, it’s a cool little weapon. However, DR wouldn’t mind sticking a FERFRANS Specialties Rate Reduction System (RRS)/Delayed Sear Activation System (DSAS) in it to slow the cyclic rate of fire (ROF) down a little bit for enhanced full-auto controllability and sustained-fire (full-auto fire) capability. The FERFRANS RRS/DSAS brings the weapon’s (DGI or Piston AR-15) cyclic ROF down below the 700-rpm threshold, so you can rock and roll (fire on full-auto) with precision, and keep all your rounds on target. DR would also be interested to see how the SCW performs with internal parts coating with something like Micro-Slick, which is a self-lubricating/lubricitous ceramic firearm coating manufactured and marketed by NIC Industries/Cerakote. We experienced no weapon malfunctions during our firing session, but we don’t yet know how the SCW performs in adverse conditions and high round count. The Colt SCW being fired by Defense Review owner/editor-in-chief David Crane in the video below is outfitted with a MagPul AFG (Angled Fore Grip), which worked well during our firing/shooting session. The AFG is a popular little tactical AR accessory, and was designed and developed by the good folks at MagPul Dynamics.